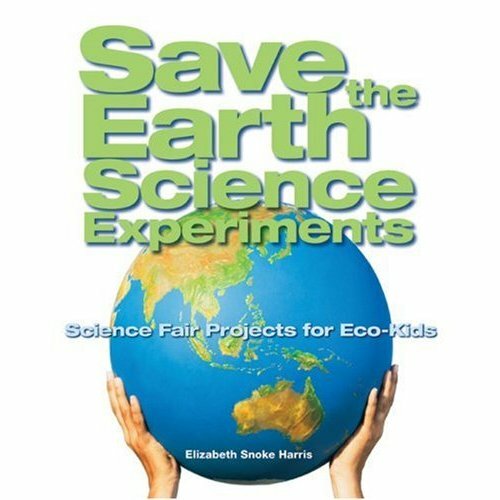 “The Experiment- How do environmental conditions affect the amount of biogas produced?” If you are homeschooling like I am, entering a science fair or simply looking for a fun way to teach your children about our impact on this planet then Save the Earth Science Experiments, Science Fair Projects for Eco-Kids by Elizabeth Snoke Harris is the book for you. This fun book (which I purchased through a Scholastic flier) is filled with experiments to get you thinking (and by YOU I do mean parents as well as the kids). The book begins with an introduction on problems occurring in the world which impact our global well being. It is then followed by a section on how to put together an effective Science Fair Project and more than 20 experiments that are related to our current environmental concerns. Throughout the book, you will find short stories and facts which detail a concern or in “The High Price of Ethanol” points out that a solution (biofuels) we think is better, is actually just as damaging. One experiment that our kids are going to do right away is, “How does recycling affect the amount of garbage a family sends to the landfill?”. This will be an interesting lesson for our household because we do recycle EVERYTHING (or at least I think we do). I’m curious to see if what I think and what is add up. Throughout the world, urban residents generate up to three times as much solid waste as rural residents. This book is a must have in every household… grab a copy online, through Scholastic or check one out at the library or used book sale. I can’t wait to share some of what we learn!